Big Red, Eco Relics’ 1937 Ford diesel truck, doesn’t make work runs anymore. These days the old girl is content promenading around the yard, accepting compliments from admirers. The Eco Relics box trucks do Big Red’s work now, and boy do they work hard. The Deconstruction Crew, led by the father and son team of Francis and Jon, stuff those trucks to the brim so fast with antiques, collectibles, and architectural salvage that we hardly have time to find a place for the last load before the next one arrives. The endless variety of artifacts delivered by our trucks never fails spark imaginations and inflame curiosities. The latest item to draw attention from the staff was a set of architectural plans fixed to foam-core boards for presentation. We’re the type of folks that love to hunch over a plan and gesture at it while discussing various details in arcane language. At first glance, some of the drawings appeared to be original master plans for the Gulf Life Tower, now called Riverplace Tower. The 28 story mid-century modern tower was designed in 1966 by local firm KBJ with help from prominent architect Welton Becket. 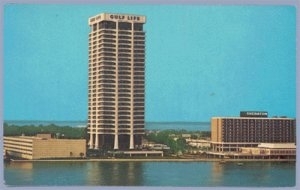 The Gulf Life tower is characteristic of Becket’s style, incorporating features like the repetitive geometric shapes of his previous work, while also foreshadowing the ultra modern design he would later produce for Walt Disney World’s Contemporary Resort. The Gulf Life tower’s unique precast, post-tensioned concrete construction rises like a ladder to sky, defining Jacksonville’s southbank skyline. It remained the tallest concrete framed structure in the world until surpassed by San Francisco’s Paramount apartment tower in 2002. Lynyrd Skynyrd fans know the Gulf Tower as the site of the band’s 1971 Earth Day concert (43 years later, Eco Relics was founded on Earth Day. Coincidence?). This performance from Skynyrd’s early years was captured on Super 8 film, without audio, and included on 1987’s Tribute Tour video. Fans of the band remember this show in particular as one of the only Skynyrd shows to feature both Bob Burns andLynyrd Skynyrd fans know the Gulf Tower as the site of the band’s 1971 Earth Day concert (43 years later, Eco Relics was founded on Earth Day. Coincidence?). This performance from Skynyrd’s early years was captured on Super 8 film, without audio, and included on 1987’s Tribute Tour video. Fans of the band remember this show in particular as one of the only Skynyrd shows to feature both Bob Burns and Rickey Medlocke in a two-drummer line-up similar to the Allman Brothers. On closer inspection, the plans that came off our truck are not the original Gulf Life master plans, but instead are master plans from the 1980s for additional entourage around the building’s base. The development was called St. Johns Place, although that name does not appear to have stuck. The plans show the original tower rising above, but drawn with lighter lines indicating that it is an existing structure. Snapping out of their original excitement over the possibility that the plans were Becket and KBJ originals, the Eco Relics crew moved on to the remainder of the plans. The rest were zoning plans, a bird’s eye view of the area just south of the Dames Point Bridge’s southern landing. The bridge was not yet completed when the plans were drawn in March of 1989, showing I-295’s proposed route over the top of existing development. The plans focus on a proposed residential development that appears to be the Merrill Hills neighborhood. The future site of the Jacksonville Arboretum and Gardens, located to the east of planned development, is zoned industrial. Between 1941 and 1961, the future Jacksonville Arboretum and Gardens site was strip-mined for zircon and other minerals used to make titanium. The property was left abandoned and purchased by the city in the early 1970s to serve as a buffer for the Arlington East Wastewater Treatment Facility. The city ignored illegal dumping and other nefarious activities on the site until 2004, when a group of citizens inquired about leasing the property for a public arboretum. The Jacksonville Arboretum and Gardens officially opened in 2008, offering the public nearly three miles of trails through a number of recovering ecosystems. It is a gem of a park and surely worth a visit. The Eco Relics staff is always interested in what we might find on the next truck. The nature of the salvage business is that our stock of salvage, antiques, collectibles, and more is always changing and nothing can be reordered. It’s become something of a contest to identify the bits of history that stream through the warehouse at 106 Stockton Street, never failing to inspire a quick session of knowledge sharing and reminiscing. Everyone knows the story of some of our relics, but no one knows the story of every relic. It is our business to make sure that those stories are not yet over.